The downside of this conversion, at least in my view, is that closing the start gate prematurely can screw up the results for the currently-running race. Even a "well-trained" starter volunteer can find it difficult to resist the temptation to close the gate and start staging the next race before the last car crosses the finish line. The problem is even more pronounced with less experienced volunteers (and experienced volunteers can be hard to come by). The green wire is a ground. The "reset/arm" button grounds the yellow wire, which both resets the timer and provides +5v on the black wire. (In the laser gate, this +5v turns on the laser.) In this circuit, +5v on the black wire causes the transistor to conduct, and allows the closed start gate to be detected as a ground on the red wire. 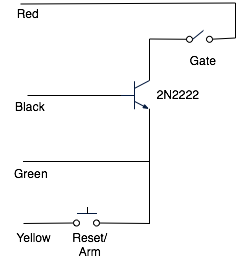 Once the race starts (the red wire gets pulled low), the black wire returns to 0v, and the transistor stops conducting; closing the gate now will have no effect until the timer is reset. My kitchen table prototype seems to work as expected/desired. I've got a race coming up in a few weeks where I hope to try out the "finished" version. Personally, I think it is better to train the start gate operator not to close the gate while cars are running. There should be no bumps or vibration imparted to the track while cars are running. Awesome concept! Please post with results and if you don't care pictures of actual wiring and parts list. gpraceman wrote: Personally, I think it is better to train the start gate operator not to close the gate while cars are running. There should be no bumps or vibration imparted to the track while cars are running. I totally agree that no one should be touching the track before the race has ended, but we all know that it inevitably will happen. I hate having to rerun races for these reasons. It is far better to have a design that allows for errors, compensates for them, and still teach not to touch the track! All these tracks, timers, and software, need to be better designed for the newbies because we all know that is too often the people running them. Thanks, I would love to see more. Our experience running 15tth Burlington this year showed that tracks with a manual reset ran heats more quickly than those with "reset on gate close." After watching ... and rewatching 4 hours of videos, the reason was clear: the finish line judge used the display info to record racers next track on their individual record card. So the gates on the "reset on gate close" tracks needed to stay open until the recording had been completed. For manual reset gates, the gate could be closed and next heat staging could begin while the finish line judge was still recording results and directing racers to their next track. The cycle time difference between the two types of gates was enough to produce severe track occupancy imbalance after 10 minutes of racing. Next year all of the finish lines will have a manual reset capbility, even if I have to wire up an outboard reset button for them! arrell wrote: Please post with results and if you don't care pictures of actual wiring and parts list. Well, OK, since you asked -- the schematic really pretty much tells the story. Somewhere along the way I realized that this could be a separate device or cable, placed in series with the existing track switch, which means it can be unplugged if desired. 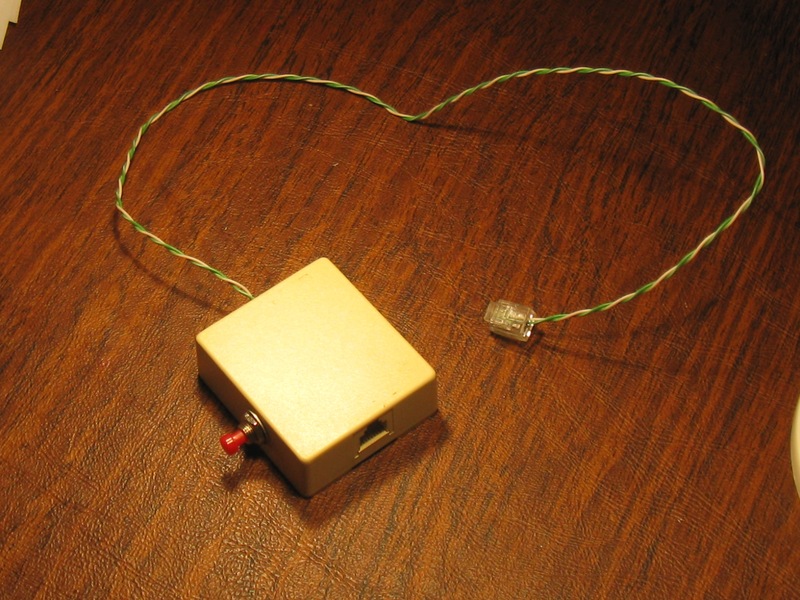 (That is, the cable from the timer now plugs in to this box, and then an RJ11 cable coming from the new device plugs in to the microswitch on the track.) 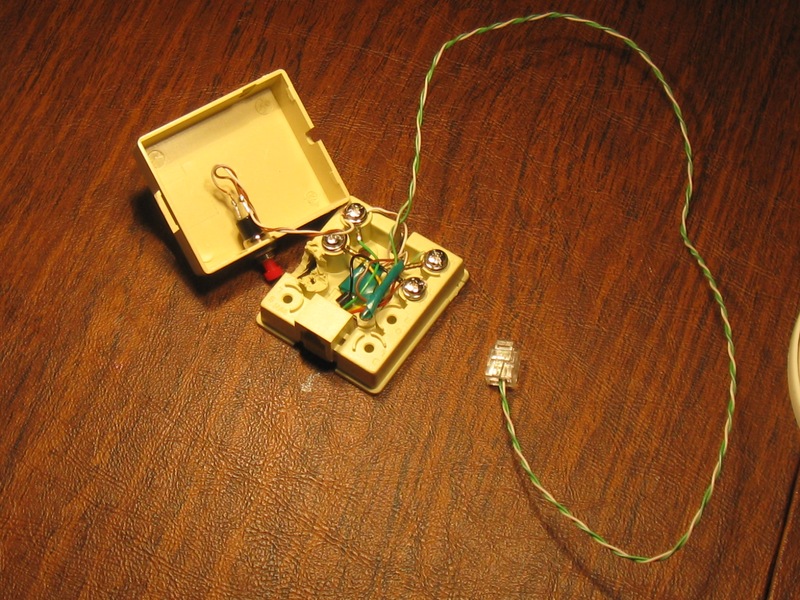 The "parts list" is just the 2N2222 transistor (Radio Shack or elsewhere), a pushbutton for reset, and the RJ11 connectors. I had an RJ11 "surface mount box" in which I was able to install the few parts after drilling and dremeling for the reset button. I soldered wires onto the transistor and reset button and then just used the screw terminals to do the hook-up. I appreciate Randy's point about not disturbing the track while cars are still running, and I agree that training the starter is important. But having had to re-run several heats at this past weekend's district race, well, I really think this is a necessary modification. I know this is a old conversation but I have a question. I made this mode and it worked very well until the gate was closed and sat for 15 min or so for intermission. I came back to find the timer dead and no power. I panic and unplugged everything the power supply for the finish line was warm and so I let it cool plugged it back in and was able to get things running again. I went back to the laser and have yet to try this again. Is there something I did wrong other than leaving the gate closed? Was this an expected outcome of leaving the gate closed? Thanks for the help and ideas. getting rid of the laser would be fantastic and I like the latching loop this does so we can use a mechanical switch and not have to worry about interrupting the current race. It is standard practice with us as well to not touch the track while a race is in progress but eager hangs can cause problems so I like to be cautious in our process.